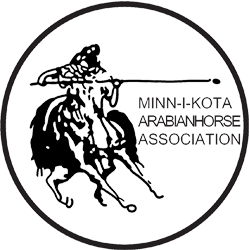 Welcome To the Minn-I-Kota Arabian Horse Association Web Site! We are looking forward to having our annual Minn-I-Kota Show July 21, 2018 one day, with two judges: Linda Hagen-Kvanbeck & Lori Conway, located at the Kandiyohi County Fairgrounds, Willmar, MN. Reminder: Stalls for the July show must be paid in advance! ** Novice Rider-A rider that has not won more than 3 first places in that division. **All A/HA classes are open to REGISTERED ARABIANS AND HALF ARABIANS. Must provide Reg. papers! **Stallions must be shown only by adults. **STALLS WILL BE AVAILABLE FRIDAY EVENING THRU END OF SHOW. MUST BE RESERVED AND PAID BY 7/15!!!! **STALL FEE $30 and MUST BE CLEANED BEFORE LEAVING Barn will open at 5:00 Friday afternoon. **All horses must be shown by Amateurs. **** The show reserves the right to combine/split classes. **All Walk-Trot may be English or Western Attire, A/HA may not ride in any other class that requires a canter or lope. ** Only A/HA Walk–Trot Classes will count towards Unplugged points. **Liberty class time limit-2 min. Must provide own labeled music to announcers stand by class 9. **Awards 1st – 6th place. **FOODSTAND ON GROUNDS. Please support them! **NOT RESPONSIBLE FOR ACCIDENTS, LOST OR STOLEN ITEMS. **ALL HORSES MUST HAVE A CURRENT NEGATIVE COGGINS TEST, PLEASE BRING ORIGINAL AND A COPY FOR THE OFFICE. Stall reservations – CALL Rae Ann 320-979-3115need to be reserved and paid for by July 15th . One day show with two judges; Linda Hagen-Kvanbeck & Lori Conway. Reminder: Stall reservations – CALL Rae Ann 320-979-3115 need to be reserved and paid for by July 15th. Stalls for the July show must be paid in advance!